Allingtons Lawn & Garden Care has excelled in garden maintenance since 2005. The business was born out of a realisation that customers wanted a proficient gardener that did more than provide mowing services and rubbish removal. Since then, our goal remains to be the best garden maintenance Adelaide has to offer. Why pick Allingtons Lawn & Garden Care? Because we really do care about your lawn and garden. Irrigation system letting you down? We’ll fix it quickly and efficiently! You do the dreaming, we do the gardening. Get your weekend back! We service a wide range of properties including residential homes strata corporations to Aged Care Facilities and commercial businesses. Allingtons gardeners are trained in all facets of garden maintenance including irrigation repair work, pruning & hedging, turf management, tree planting, weed control and garden pest spraying. You’re in good hands. Do you hate losing your weekends to mowing an overgrown lawn and fighting off an invasion of weeds? Let us help. Call us and put the weekend back in your life. But don’t find the time to do what you actually enjoy in the garden? We work alongside our clients ensuring their time spent in their garden is quality time. We’ll help you enjoy what you want to do in your garden—without your joy being lost under a never-ending workload. The team at Allingtons Lawn & Garden Care understand that all important adage “little and often”, which applies to many of the regular gardening disciplines including hedging plants, pruning trees fertilising lawn and lawn mowing services. However, there is so much more to delivering what is our mission statement, “Garden Maintenance Excellence”. We understand communication is the glue that holds all good relationships together and gives clarity and confidence to clients and customers alike. It has been said that systems run businesses and people run systems. In the same way, gardening should be viewed in a systematic way. Why? Because timing is crucial in gardening. System failure can cost lots of money to fix, while our “little and often” approach keeps your garden both looking great and growing much healthier. And it is much less hassle than you’d think. Once a system is put in place, what we call a maintenance program and gardening specifications, our trained team follows the system and gets the job done. Choose Allingtons for the best garden maintenance Adelaide has to offer! At Allingtons, we work on a 100% satisfaction rate, following up on anything that would affect a positive outcome for our clients. We listen to our clients, and tailor their garden maintenance so it is specific to their needs. Our team is friendly, ethical and fully trained in all aspects of garden maintenance and care. 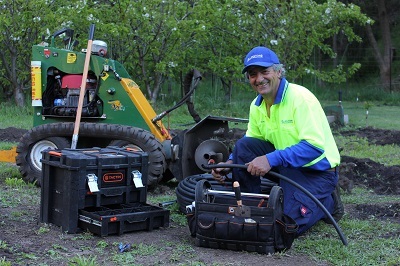 We guarantee all our irrigation parts and labour for 12 months with no call out fee. We use Australian Standards Approved parts. We invite our customers to share openly with us. We’re committed to rectifying anything that gets in the way of a harmonious working relationship. Then and only then, can we truly aspire to our goal of “garden maintenance excellence”. We are passionate about fruit trees and spend a lot of time and effort helping our clients develop their orchards. We have been pruning fruit trees for many years now, and take great delight in knowing our clients’ crops have been bountiful. It would be a thrill to share our knowledge with you and to assist with bird-netting soil improvements. These days an irrigation system is no longer seen as a luxury, but a necessity if you are serious about your garden and the cost of water. Allingtons can help you install irrigation controllers, drip line and we specialise in Smart irrigation weather stations and sensors. Pop-up sprinklers need to be checked periodically to ensure they are working properly and dripper systems or drip line systems should be flushed and checked to ensure they are functioning as they should. Whether it’s lawn maintenance, pruning, hedging, irrigation repairs or general gardening, if you are looking for a great gardener or thinking of garden maintenance, why not give us a call. Let’s have a chat about your garden. 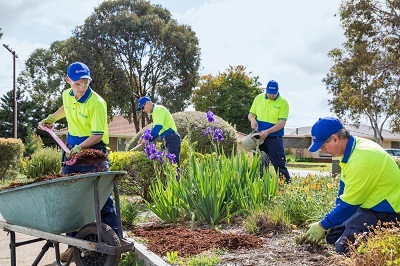 We truly believe Allingtons have the best garden maintenance Adelaide has to offer. We have used David Allington’s services for years, and we really cannot speak highly enough of him. Whatever the task, he always does an excellent job of it and at a very reasonable cost. We have appreciated the fact that he cleans up afterwards, taking difficult–to–dispose of piles of prunings and cuttings with him for disposal. He has a wealth of knowledge about all things horticultural and we have happily followed his advice about such things as plant selection and natural forms of pest control. We have also admired the thoughtful way in which David has mentored young people in his profession. I am very happy with the service received from Allingtons Lawn & Garden Care. David is efficient, professional and always willing to give advice on any gardening problems. He is prompt, affordable and advises if he is not able to make it on a specific day. Thank you for your "old fashioned" service. I give Allington’s a 5-star rating for their exceptional service, quality and expertise. They offer a breadth of industry knowledge that is unrivalled in their field. I’ve used them for fruit trees, pruning, fertilising, irrigation and the results have been outstanding. These guys are the real deal! Thanks Allingtons. 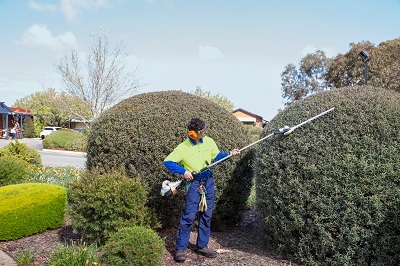 As the former Manager for Kimberley-Clark Adelaide, at both the Direk site and prior to that Pooraka site, I procured the services of Allingtons Lawn & Garden Care for regular grounds maintenance, soft landscaping and irrigation repairs and trouble shooting. I found their attention to detail excellent and their work ethic exemplary. David's long experience always delivers a satisfying result finish for us, that's why we have used his eminent and professional service for 20 years now. We can recommend David for all your gardening needs. 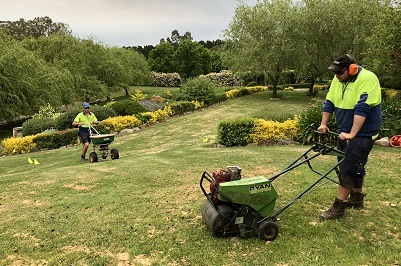 We engaged David and his team at Tea Tree Gardens Retirement Village to assist our staff and residents to really get our established gardens under control after a period of growth. Their customer service, their willingness to assist, and their resident friendly approach was at all times a pleasure to deal with. Our gardens are now looking better than ever and Allingtons knowledgeable manner and friendly polite approach was so easy to work with.